The human eye is a miraculous structure, a one inch globe that focuses the entire world on tissue the size of a postage stamp. 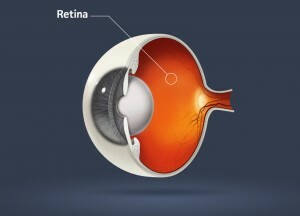 For you to see clearly, incoming light must come to a precise focus on the retina at the back of the eye. The entire structure and all its components are dedicated to that end. In this cross section of the human eyeball, we can trace the beginnings of vision. 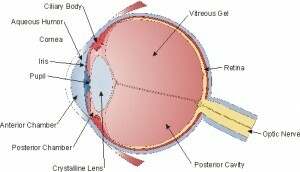 Light enters the globe through the cornea (far left). This tissue is clear and normally has no blood vessels. It receives all its nutrition from oxygen that it can derive from the environment and from the tear film that bathes it. The cornea contributes about two thirds of the focusing power of the eye. The tear film itself forms a smooth refractive surface bending light uniformly. Next is the anterior segment. This area is divided into the anterior chamber, the space in front of the iris and posterior chamber behind the iris. This space is filled by a liquid, called the aqueous humor. This fluid is produced in the cilliary body, a radial structure that supports the iris. This incoming light then encounters the iris. This reactive diaphragm varies in color from blue to green and most commonly to brown. In the center of this structure is a hole, called the pupil. The iris adjusts the pupil’s diameter in reaction to the intensity of incoming light. The brighter the light, the smaller the hole. Aqueous humor is constantly produced behind the iris and flows across the surface of the crystalline lens through the pupil and exits via a sieve-like structure that surrounds the base of the iris called the trabecular meshwork located in the angle between the back of the cornea and the front of the iris. Incoming light then encounters the crystalline lens. The lens is also clear and devoid of blood vessels. The constant flow of aqueous across its surface nourishes this tissue. This structure has a natural tendency to bulge, to become thicker at its center. The lens is suspended in a capsule. In a straight gaze it contributes an additional one third of the eye’s focusing power. When you are looking at a distance, it is held compactly by the surrounding ciliary process, and not allowed to enlarge. When the ciliary muscle relaxes, the lens changes shape adding more magnification for reading. This occurs naturally as your eyes converge to focus on objects closer than twenty feet away. Light then passes through the posterior cavity. This part is filled with the vitreous gel, a thick gelatinous substance, that does not regenerate with time. This supports the globe and holds the retina in place. Finally, in an eye needing no vision correction, the light comes to a sharp focus on the retina. Covering the inside of the sphere, and extending in all directions all the way forward to its attachment at the ora serrata surrounding the base of the ciliary body, the retina is a vast network of light receptors. This is where vision begins. The retina uses a rich vascular network to fuel an electro-chemical reaction that turns light into sight. Light’s energy is translated into an electrical impulse by a chemical reaction that takes place at its receptors. The peripheral portion of this structure is composed of receptors known as rods. They are very sensitive to light and movement but only translate signals in black and white. The macula is a 3 to 5 mm oval, surrounding the fovea at the approximate center of the retina. This spot has the highest concentration of receptors called cones and is responsible for color perception and the sharpest vision. Retinal receptors are wired directly to the brain via nerve fibers.